Temporary lakes have sprung up all over Manhattan again this week, sometimes more than twenty feet wide and a foot deep, spanning curbs and pooling in gutters, the aquatic remains of last week's rain and snowmelt. This surprise limnology—often demanding new, indirect lines of approach from one side of the street to the next—reminded me of David Gissen's recent, recommended book Subnature, which includes an entire chapter on urban puddles. 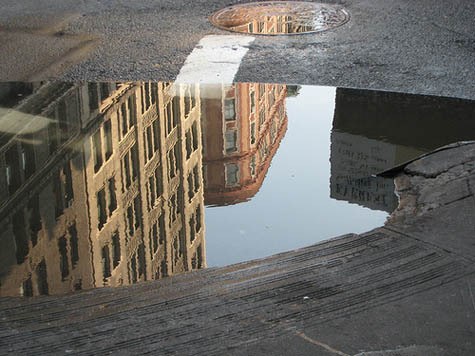 "Although we often think of puddles as inconsequential," Gissen writes, "they appear in architectural history in prominent ways—in drawings of ruins, photographs of decaying buildings, and experimental designs that attempt to use water in provocative ways." Now, however, "these stagnant pools of water, once signifying society's vulnerabilities, appear to have disappeared in much contemporary work"; indeed, he adds, contemporary architects have seemingly always "viewed stagnant water with suspicion." There is good medical reason for this suspicion, of course; indeed, the Centers for Disease Control advised last year that "neglected swimming pools"—i.e. stagnant bodies of water—are fast becoming vectors for mosquito-borne disease. The CDC specifically cites "the adjustable rate mortgage and associated housing crises" as unexpected disease incubators: "Associated with home abandonment was the expanding number of neglected swimming pools, jacuzzis (hot tubs), and ornamental ponds. As chemicals deteriorated, invasive algal blooms created green swimming pools that were exploited rapidly by urban mosquitoes, thereby establishing a myriad of larval habitats within suburban neighborhoods," they wrote. In any case, Gissen describes "visions of the undrainable city" as a kind of sickly counterpart to the modern, infrastructurally managed, rational metropolis, pointing out that "the waters inundating the modern city rained from above and surged from below." These overload our modern streets and sewers, bringing even 21st-century cities closer to the flooded Roman basements of Piranesi than to the hygienic visions of Le Corbusier, Gissen suggests. I'm reminded here of a disconcerting remark made by Alan Weisman in The World Without Us that the subways of New York City would be irreparably flooded within only 36 hours if the city's underground pumps ceased to function. While reading Gissen's chapter on puddles, however, one of the first things that came to mind is that someone should produce a puddle map of New York—an urban atlas of temporary flooding. Set your parameters—puddles one foot deep by thirty-feet wide, say, or, more accurately, a volumetric guideline (at least one hundred square-feet of water or no less than 120 gallons)—and bring these fleeting aqueous forms into the geographic consciousness of the city. 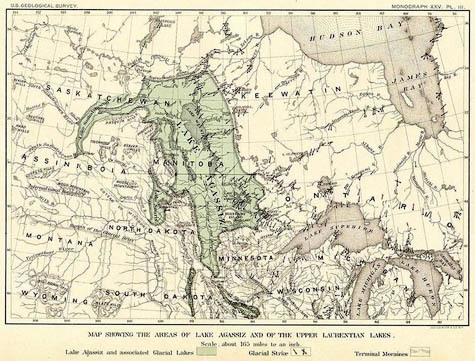 From one rainy season to the next, an accelerated paleolimnology of New York thus comes into being; the Lake Lahontans and Lake Agassizs of the five boroughs are given their cartographic due. Here a tiny lake once stood, historical plaques could read, bringing to mind a liquid version of Taylor Square, the famed "smallest park" in Cambridge, Massachusetts. Have a look at one of my favourite urban photographers, Rut Blees Luxemburg and her work for London Underground - puddles feature! There's a great comic about mapping the puddles of New York in Ben Katchor's amazing collection, The Beauty Supply District. Sadly, I can't find a link to the actual strip, but seek it out--the whole book is fantastic.